I received seven e-mail applications for the post of my female-room mate. 4 were males. So i rejected them without much ado. Out of the remaining 3 girls, two were my blog-mates and one was an anonymous mailer. The two blog-mates bashed me up with non-parliamentary words. The anonymous mailer was very mushy and her/his mail was almost like reading a M&B novel. I also received a proposal from wolf-anusha. Her mail was found in the junk list. I didn't bother to read it. That is how i throw attitude. In early January of the year 1995,when I was in class-8, my biology teacher said that AIDS was a sexually transmitted disease. I counter attacked her with my statement saying," Ma'm; Birth of a baby is the only sexually transmitted disease". I was sent out of class. That was the exact moment i decided that i would become a scientist. I started working towards my goal. Immediately, i called up my friends Ian Wilmut, Keith Campbell and gave them a ten minute pep talk. 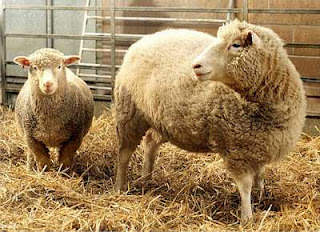 The very next year, they came up with Dolly (The first cloned female sheep). The world never knew the actual brain behind cloning. Now for the first time ever, this secret is revealed in my blog. Chronicwriter used to conduct secret nuclear experiments for an undisclosed Western Antartican province and was on the verge of Vasectomizing a female python when he decided to focus on this blog instead. I started discovering many things about animals. I would soon publish all my discoveries in book form. Please buy the book when i publish it. One such experiment made me to study about cows. I went to my Uncle McDonald's farm and asked his permission whether i could conduct some experiments on his cows. He was more than happy. My experiment was to find out, if a cow could yield more than 20 litres of milk. So i took a bucket and went to the farm and started milking a cow. After one hour of milking, there wasn't much milk in the bucket. I was disappointed and came back home with a dejected heart. Later when i talked with Uncle McDonald, i came to know that the only animal in that farm was actually a bull and not a cow. No wonder the bull smiled at me, while i was milking it. Will the world ever see Girze? well... waiting for new ground breaking discoveries n inventions.. The world is blessed to have a scientist like you..seriously! And i was just wondering all the fun the bull had.. rofl.. I just can't stop laughing!!! Ah!! Had I known you were the REAL brain behind Dolly, I would've incorporated that in my answer on Dolly last week and earned some brownie points!!! OMG!! Will the world ever credit you for this?? You deserve the accolades mate!! so you ^milked^ a bull .. :D..
you guys will have to share a soul...more than that, Clonic writer might ask "Gimme RED"...what will you do then? Brain behind Dolly??? Wah re wah..
oye ! but who's the lucky girl?? now, i know a scientist too!! O man... Chriss boy... U don leave bulls also???? I thot u had restrictions!!! Ha ha... Nice blog man... N who's d finalist in d room mate search??? And the problem is, when they will make a documentary of how they made a Gibra, people will switch it off thinking the scientists are a bunch of nuts who think they made a zebra (note resemblance to Gibra), which existed anyways. //Will the world ever see Girze? y r u so damn funny?? forget a Girze, i would be astonished if the world ever saw a ChrizWo!! did u actually say that real smart statement...abt children and STDs...? prason, i guess u better type when u r drunk... u r goin WILD without the influence of alhocol ( spelling is rite?? i m drunk)!!! no wonder they weren't.. You cant mate with a neck. u milked the bull :P...damn...i was wondering how crazy scientists can be :P..
U ? scientist? hmmm Smart. Kya brain hai yaar. Ohh!!! Need I say that I thoroughly enjoyed the post?! I DID! What the heck anyays. I never applied :P.
Not to mention your own 'traditional' way of milking bulls. this comment of yours makes me to think... you havent applied.. but still i am including your option in the wild card round.. all the very best..
btw, did you try drinking the milk. ? that could explain your scientific intelligence. Wokay. How abt cloning you? Good option. Pls aid me with this. I will start a Chrony Clone Relief fund series and become one millionpathy. God u made me laugh so much...such a gr8 discovere u are..u really deserve an award for milking a bull buddy...bravo!! in such a case, i'd share the underwear with my clone.. he can insert his legs in one hole and ill insert mine in the other hole..
Dont disclose our further cross breeds because there are plagiarism in blogs too and we might miss our NOBEL prize! !